Baxter State Park offers 10 campgrounds and many remote campsites for visitors. Camping facilities include tent sites, bunkhouses, cabins, and Adirondack-style lean-to shelters. The summer camping season is from May 15 to Oct. 15, weather permitting, with a special extended season available until late October at select campsites. The summer camping season at Chimney Pond campground is June 1 - Oct. 15, weather permitting. Please see the Park website for details. If you are planning an early or late season visit, it is best to check first with Park Headquarters. A winter camping season extends from December 1 to March 31. Special rules apply and can be obtained from Park Headquarters or viewed on the Park website. Current camping fees are posted on the BSP website. Check-in time for campsites is 1:00 p.m., and checkout time is 11:00 a.m. All campers must be through the gate by 8:30 p.m. on the first night of camping. If you miss the first day of your reservation, please call Park Headquarters, as reservations are released on the second day at 4:00 p.m. for no-show reservations. Baxter State Park offers eight frontcountry campgrounds that may be accessed by vehicle during the summer season. Each of these campgrounds is staffed by a Ranger. Daicey Pond Campground is located on the western side of Baxter State Park. This campground offers 10 rustic cabins, each with an outdoor fireplace and picnic table. Cabins provide beds with mattresses, gas lights, and woodstoves. Canoes are available for rent. Popular activites at Daicey Pond include hiking, swimming, canoeing, fishing, and cross-country skiing in the winter. Key information: All bedding and cooking utensils must be provided by the camper. You will need a sleeping bag or sheets, blankets and pillows. Water is from the pond and must be treated. All cooking must be done outside the cabins. There are no lights in the bedrooms. Lanterns and flashlights are recommended. Kidney Pond Campground offers 12 rustic cabins. All cabins except #3, #4, and #5 are walk-in. Cabin #12 (OJI) can only be accessed by a one-mile paddle or hike. Cabins are equipped with beds, a stove for heat, and gas lights. Communal fireplaces are provided for most cabins. Cabins #1, #2, and #12 have a fireplace for outdoor cooking. Key information: All bedding and cooking utensils must be provided by the camper. You will need a sleeping bag or sheets, blankets and pillows. Drinking water should be brought from home. Water from the pond is not potable and must be treated. All cooking must be done outside the cabins. There are no lights in the bedrooms, so lanterns and flashlights are recommended. Roaring Brook is one of the busiest campgrounds in Baxter State Park. It offers 9 lean-tos, 10 tentsites, and one 10-person bunkhouse. Firewood is available for purchase. The Bear Brook group area is located about 2 miles away, with three group sites holding 14 people per site. Roaring Brook is the most popular trailhead for hiking to Chimney Pond and Katahdin, as well as Russell Pond in the Park's interior. Shorter hikes include the Roaring Brook Nature Trail and Sandy Stream Pond. Other nearby locations include the Avalanche Field trailhead for Martin Ponds, the Katahdin Lake day use shelter, and Katahdin Lake Wilderness Camps. Three backcountry sites are associated with Roaring Brook: Martin Ponds, North Katahdin Lake, and South Katahdin Lake. Each of these sites offers a 6-person lean-to and canoe. Abol Campground is located in the southwestern part of Baxter State Park, in a northern hardwood forest near the base of the Abol Slide on Katahdin. This campground offers 12 lean-tos and 9 tentsites. Facilities include a Ranger station and vault toilets. Firewood is available for purchase. The Abol Trail departs from the campground and is the shortest route to the summit of Katahdin. Established in 1939, Katahdin Stream is a popular family campground providing access to Katahdin via the Hunt Trail / Appalachian Trail, as well as numerous streams and ponds in the area. This campground offers 12 lean-tos and 9 tent-sites. Facilities include vault toilets, accessible toilets, and a day use picnic area with covered shelters. Firewood is available for purchase. The nearby Foster Field group area provides three group sites with capacity for 12, 13, and 25 people. Nesowadnehunk Field Campground is the most remote of the roadside campgrounds in Baxter State Park. It provides easy access to Ledge Falls, a popular swimming spot during the summer. The campground provides 11 lean-tos, 9 tentsites, and a four-person bunkhouse. Several of the tentsites are walk-in, with access via a footbridge over Nesowadnehunk Stream. Nesowadnehunk Campground provides trailhead access to Russell Pond via the Wassataquoik Lake Trail and day hikes to Doubletop Mountain. Two backcountry sites are associated with Nesowadnehunk: Center Pond and Little Wassataquoik Lake. South Branch Pond is the largest campground in Baxter State Park, and is very popular with families. The campground offers 12 lean-tos, 21 tentsites, and an 8-person bunkhouse. Canoes are available for rent. Firewood is available for purchase. The campground offers excellent access to hiking. Trails to South Branch Mountain, North Traveler, and the very challenging Traveler Loop begin at the campground, as well as shorter hikes to South Branch Falls and The Lookout. Three backcountry sites are associated with this campground: Upper South Branch (1 lean-to); Pogy Pond (1 lean-to); South Branch Canoe Site (1 tent site, 1 lean-to). Trout Brook Farm is one of the Park's quietest campgrounds and provides a great base for exploring Matagamon Lake, as well as backcountry hiking and camping in the northern part of the Park. Canoes are available for rent, and firewood is available for purchase. Many backcountry sites are associated with Trout Brook, including North West Cove, Boody Brook, Little East, Webster Stream, Billfish Pond, Webster Outlet, Long Pond Outlet, Little Coffeelos, Long Pond Pines, Telos Cut, Lower Fowler Outlet, Hudson Pond, Lower Fowler Pond, Togue Ledge, Middle Fowler North, Pine Point, Middle Fowler South, Second Lake, and K-P Dam. Russell Pond is the most remote campground in Baxter State Park, offering 5 lean-tos, 3 tentsites, and an 8-person bunkhouse. Facilities include a bear line, pit outhouses, canoe rental, and a staffed Ranger station. Russell Pond campground provides very good trout fishing in local ponds, as well as access to Wassataquoik Stream, Wassataquoik Lake, and several popular backcountry campsites. The campground is accessible via a 7.2 or 7.6 mile hike from Roaring Brook, or 9.6 mile hike from South Branch Pond. There is no vehicle access. There are no bridges over Wassataquoik Stream, and all hikers must cross via wading or rock hopping. Trail access from Roaring Brook may be closed during times of high water. Established in 1938, Chimney Pond is one of the most popular campgrounds in Baxter State Park. Chimney Pond Campgound is located in the bottom of the South Basin, a massive glacial cirque with granite walls rising nearly 2,000 feet overhead. Chimney Pond provides hiking access to all Katahdin peaks, as well as to Russell Pond via Davis Pond and the Northwest Basin Trail. Access to Chimney Pond is via foot travel only - there is no vehicle access. Chimney Pond campground provides 9 lean-tos and a 10 person bunkhouse. There are no tentsites at Chimney Pond. Open fires are not permitted due to accumulated environmental degradation. Facilities include a bear line, outhouses, and a staffed Ranger station. Baxter State Park provides many remote backcountry campsites scattered through the Park. Each backcountry site has a fire ring (except for Davis Pond), an outhouse, and a water source that requires treating. Remote backcountry sites allow individual parties, usually a maximum of four, the opportunity to camp in isolated and primitive areas. For more information on backcountry campsites, please visit the Park's Backcountry Camping page. Katahdin Lake Wilderness Camps (KLWC), established in 1885, are located on the south shore of Katahdin Lake in Baxter State Park, about three miles from the base of Katahdin. There is no road access. To reach KLWC, one must hike, ski, or snowshoe 3.3 miles, depending on the season. Accomodations consist of eight rustic cabins of various sizes. KLWC also features a main lodge and dining room, where delicious and hearty meals are served by the host, and a cozy living room where visitors can relax with a book or a puzzle. 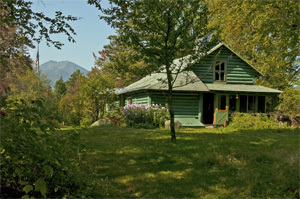 The unique serenity and beauty of the landscape attracts naturalists, hikers, fishermen, artists, and families looking for a wilderness adventure.